General Electric Co.'s move to buy as many as 25,000 rechargeable cars, almost half of them from General Motors Co., may herald more purchases of electric vehicles for corporate fleets. GE unveiled its order this week as automakers prepare a new generation of battery-powered autos, including GM's Chevrolet Volt and Nissan Motor Co.'s Leaf. The cars will reach showrooms as early as the end of this year. GM's portion of the order is 12,000 vehicles, including the 2011 Volt. Corporate purchases can help nurture a viable commercial market for the cars, because initial demand among retail buyers will be muted, said Ray Lane, managing partner at venture capital firm Kleiner Perkins Caufield & Byers. “Mass adoption by consumers of electric vehicles will happen slowly because of range anxiety and cost,” said Lane, who said his Menlo Park, Calif.-based firm has invested more than $1.5 billion in green technology startups that include carmakers Fisker Automotive Inc. and Norway's Think. Fleet operators may react differently, because “the business case for electric vehicles is pretty good,” said Lane, who is also chairman of Hewlett-Packard Co. While purchase prices may be higher, corporations would reap savings from tax credits and lower costs for electricity than gasoline, Lane said. Another advantage: “It's easier to install charging equipment at a fleet garage,” he said. GE would see an additional boost, because Chief Executive Officer Jeffrey Immelt is positioning the company to benefit from energy-efficient technologies by producing batteries, car-charging stations and smart-grid systems. “Being a first mover on this, they get not only the moral high ground, but also seize the initiative on charging-station technology,” said Peter Sorrentino, a senior portfolio manager at Huntington Asset Advisors Inc. in Cincinnati, which held about 5.48 million GE shares as of October. Hybrids such as Toyota Motor Corp.'s Prius made up about 2.4 percent of U.S. sales through October, based on data compiled by Bloomberg. 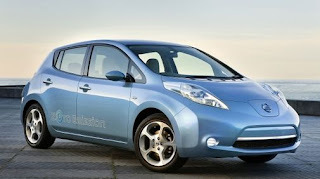 Worldwide market share for hybrids and battery-powered cars may be 7.3 percent a decade from now, researcher J.D. Power & Associates says. At United Parcel Service Inc., hybrids and other alternative-fuel vehicles account for about 2 percent of a global fleet of 102,000. FedEx Corp. said its total is about 2.5 percent of the 75,000 vehicles in its Express and Ground units, excluding its freight operations. Between them, UPS and FedEx deliver about 80 percent of all packages in the U.S.
UPS doesn't have a timetable for adding more such vehicles, said Michael French, a spokesman for the Atlanta-based company. Neither does FedEx, according to Deborah Willig, a spokeswoman for the company. FedEx CEO Fred Smith is chairman of the Electrification Coalition, a Washington-based group of transportation and energy executives. Other companies are already embracing electric cars and hybrids for passenger use. Google Inc., which has 30 hybrid and plug-in models in use for employees at its headquarters in Mountain View, Calif., will “transition and expand that fleet next year with new electric vehicles that are coming into the marketplace,” said Parag Chokshi, a spokesman, without elaborating. Closely held Enterprise Holdings Inc. and Hertz Global Holdings Inc., the two biggest U.S. rental-car companies, have ordered hundreds of electric vehicles, including Nissan Leafs. GE, which agreed with Nissan in April to research car-charging infrastructure, hasn't specified what electric models it plans to order beyond the Volt. Buying the Chevrolet sedan is a boost for a car reliant on different technology than either pure battery power, such as the Leaf, or the gasoline-electric combination in the Prius and other hybrids. The $41,000 Volt is designed to go 25 to 50 miles on electric drive before an onboard gasoline engine starts charging the battery. Buyers will be eligible for a $7,500 rebate from the U.S. government. Business backing for new technology such as advanced autos is going to be more important as government spending wanes, Immelt said in a speech in London last month. Kleiner Perkins's Lane said Republican control of the U.S. House of Representatives in the new Congress next year may curb future incentives created under the 2007 energy bill.